So in a long-awaited and according to local energy traders, overdue response, Canada’s largest oil producing province ordered what Bloomberg called "an unprecedented output cut", an effort to ease a worsening crisis in the nation’s energy industry and adding to global actions to combat a recent price crash ahead of this week's OPEC+ summit where oil exporters will similarly seek to slash output (something which all OPEC+ nations agree upon, but nobody wants to be the first to cut its own production). Alberta Premier Rachel Notley followed the advice of local producers like Cenovus Energy and Canadian Natural Resources, which have been hammered by record low prices for heavy Canadian crude. The crisis has caused some producers to reduce production on their own, slash dividends and delay next year’s drilling plans, while the Alberta economy has - by local accounts - slumped into a recession. The plan, which was announced late on Sunday, will reduce production of raw crude and bitumen from Alberta by 325,000 barrels a day, or 8.7% from January until excess oil in storage is drawn down. The reduction would then drop to 95,000 barrels a day until the end of next year at the latest. The cut by Canada, the world’s fifth-biggest producer, follows fresh promises over the weekend by Saudi Arabia and Russia to extend their deal to manage the oil market. 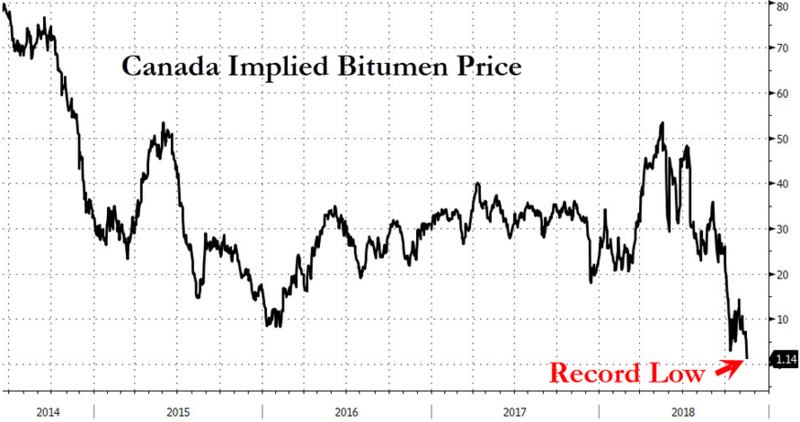 Global prices crashed last month by the most in a decade, a plunge that particularly battered producers in Alberta amid the abovementioned surging oil-sands output, a shortage of pipeline space, as well as heavy U.S. refinery maintenance. The news out of Canada, together with this weekend's temporary trade war truce between the US and Canada, helped lift U.S. benchmark prices as Canada's output cuts will likely slash the volume of oil flowing into Canada's southern neighbor and the world’s biggest consumer; as a result WTI rose as much as 5% Monday morning in Asia. To many, the production cut was not only long overdue, it was also inevitable in light of the record production coupled with record low price, a disastrous combination which would otherwise culminate with mass defaults. 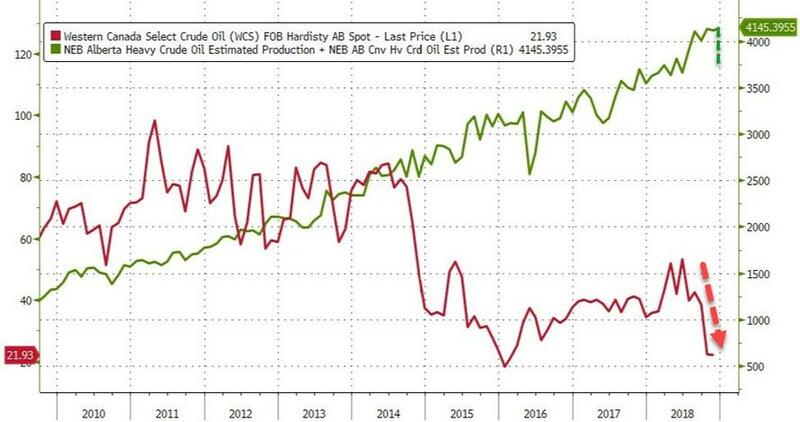 That said, one wonders just how much of an impact this initial step to rationalize the Canadian oil market will have: the amount being cut is more than the total production of each of OPEC’s three smallest members: Equatorial Guinea, Gabon and the Republic of Congo. It is still relatively modest in the grand scheme of things. Notley said that the curtailment plan, which will apply to both oil-sands and conventional producers, should narrow the discount between Western Canada Select and U.S. benchmark oil by at least $4 a barrel and add an estimated C$1.1 billion ($830 million) in government revenue in the fiscal year starting April 2019. Alberta expects the 325,000-barrel-a-day reduction to be in place for the first three months, while storage is drawn down to historical levels. After that, the government will work to match capacity with production. Further reductions in the curtailment are expected in the fall and winter as additional rail capacity comes online. The measure could be removed earlier than the end of 2019, based on market conditions, the government said. The output cut also seeks to stabilize the local economy: the action is designed to prevent job cuts by letting companies keep people on because they can “see a light at the end of the tunnel,” Notley said at a news conference. Underscoring the severity of the local oversupply crisis, the Alberta announcement marks the first time the provincial government has ordered a production cut since the 1980s, and that previous move was meant to protest federal energy policies, not solely to boost prices. A chorus of companies, investors and industry leaders has rallied to the idea in recent weeks, saying that no other measure could help work down the glut of oil backed up in storage as quickly. Even Notley’s main political rival - United Conservative Party Leader Jason Kenney - has called for a curtailment. The only dissenting voice has come from Canada’s integrated oil companies, whose refineries have been benefiting from the cheaper feedstock. Still, Notley's announcement was generally priced in after Notley last week assured Albertans that a decision on curtailing output was coming; that helped boost heavy Canadian crude prices by 49% last week, although even after that gain, Western Canada Select crude was trading for $29 a barrel less than U.S. benchmarks. As shown in the top chart, WCS closed at $13.46 a barrel earlier this month, the lowest on record. The grade’s discount to U.S. benchmark oil prices widened to $50 a barrel last month, also a record.